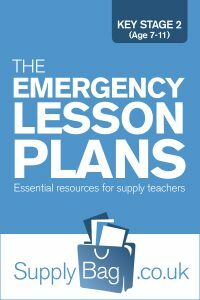 These emergency lesson plans for Year 5 Numeracy are only to be used by supply teachers who are faced with no planning or easily accessible resources. Also to be used following the guidance notes here. Ordering, partitioning and rounding decimals. Find decimals by first dividing numbers on a calculator by non-factors. Look at 11 x and 12 x table, notice any patterns, past 100 too? Written methods (grid/Napier's bones? Russian?) of HTU x U, U.t x U and/or HUTE / U. Look at common multiples of various factors. Translate to LCM in fractions if able, 1/3 and 1/4 can be converted to 4/12 and 3/12, show physically cake/bar of chocolate cutting on board. Sort a set of data using a Venn Diagram, and/or a Carroll Diagram, be careful not to confuse the two. Using a calculator to check sums you have written on board (write ten on board, using brackets? and get about half wrong!) Children to estimate first. Probability: Children to make up predictions, it will rain tomorrow, England will win the World Cup, a dodo will be found wandering on the beach down the road, and place them on a scale of probability… use language first, never, unlikely, even chance, likely, certain, but then divide numerically, 0% chance – 100% chance. Find the mode: most often! Collect data from classroom, can be words (favourite author, science topic) to start, but then onto figures (month 1-12 in which born, house number etc.) Represent in frequency table, pictogram, bar/line graph and find the mode. Give children a set of data, hidden in story perhaps, or include irrelevant information at least, and ask them to interpret/organise into chart/table form, ready to answer your questions (the difference, the range, total, how many more if, etc.) then ask them to create two questions to ask rest of class. Estimating length of objects around the classroom, or go and collect a few different leaves, and estimate their lengths (place in length order first). Measure in cm. Give set of measurements (relate to children's lives) and ask to convert to another unit of measure, i.e. shoe 18.9cm, to mm, can of Coke 330ml, to l.
Give children a number sentence, in which you have included brackets, show how they must calculate the brackets first, set out clearly, and ask them to work through more examples. Parallel and perpendicular: investigate/draw/classify shapes according to these newly learnt terms. Have you got protractors? Estimating, measuring and drawing given angles. Coordinates: draw a map (theme park? treasure island? perfect school?) on the board, label the lines, not the spaces, slowly introduce coordinates in the spaces (2.5, 3) or (25, 30). Pattern in translation: cut a square, cut a piece out of it, and place it on the parallel side, translate shape. Children to create their own. Pattern in reflection: mirrors? Use hypothetical line of symmetry, reflect below, can they also reflect their simple shape to left and to right? Areas and/or perimeters of regular/irregular polygons, start with quadrilaterals, move onto two rectangles making an L shape. Number machine: firstly give input and operation (6 goes in, machine *2, children to answer 12 is the output) change operation, then give input, and output, children to work through all 4 operations finding possible functions. Explain to children concept of scales on maps, draw simple representation on board, children use function machine idea to generate actual distances on your scaled map. Equivalent fractions, fractions of cake/pizza/egg boxes that are equivalent, look at patterns in equivalent fractions 'number line' and relation to times tables i.e. 1/2, 2/4, 3/6, 4/8. This has been done earlier in KS1, so quickly move onto non-unit fractions, 3/4 = 6/8 etc. Percentages: first introduction to percentages maybe, so look at meaning (% is out of 100, recognise division line in symbol %) 100% as whole, 50% as half, 25% and 75%. Look at how to find simple percentages of shapes to begin with, then numbers/quantities if they've got it, esp. % mentioned above, and moving onto 10%, then multiply by 4 to find 40% etc. Investigate connections between fractions and percentages, 1/2 of 360 = 50% of 360, etc. You write fraction question, they write equivalent percentage question etc. Then challenge them to work them out.